13 -17 Colchester Castle – join the surgeon as she tells grim tales of amputations, tooth extractions and blood sucking leeches! 21 & 22 Bolsover Castle – Celebrate St Georges day by coming along to Bolsover and meeting Sir Thomas as he arms for battle. Armour & weapons demos and talks, trying on armour and crime and punishment trials. 5-7 Bolsover Castle – Make your bank holiday that little bit more special with a trip to Bolsover Castle. Meet Sir Thomas as he arms for battle. Armour & weapons demos and talks, trying on armour. 6-8 Carisbrooke Castle – Time Travellers go Royal – Join Ralph Fitzherbert, a loyal Yorkist from the war of the roses as he arms for battle, budding young knights can also try on armour. With music from Wynndebagge the Elizabethan musician and Royal Top Trumps and revolting peasants from Griffin Historical. 17 Bolsover Castle – Join us for this special one day event to celebrate fathers day. Meet Sir Thomas as he arms for battle. Armour & weapons demos and talks, trying on armour. 25-29 Bodiam Castle – Medieval week for schools. Would you like to visit Bodiam Castle, why not make your students visit even more special by visiting Happening History at the castle. All week we will be running displays on medieval life. Students can learn about clothing, food, marriage, try on armour, hold a weapon or learn about medieval surgery. Booking is essential so please contact the castle directly or we’d be happy to pass on your details. 2 – 6 Bodiam Castle – Medieval week for schools. Would you like to visit Bodiam Castle, why not make your students visit even more special by visiting Happening History at the castle. All week we will be running displays on medieval life. Students can learn about clothing, food, marriage, try on armour, hold a weapon or learn about medieval surgery. Booking is essential so please contact the castle directly or we’d be happy to pass on your details. 14 – 15 Bodiam Castle – Come and be put on trial for your crimes! Come and learn what was a crime in medieval times and what the brutal trials and punishments might have been. 24 Chesterfield Museum – join the surgeon as she tells grim tales of amputations, tooth extractions and blood sucking leeches! 5-8 Carisbrooke Castle – Time Travellers go secrets & spies – As part of a larger event Wel will be putting you on trial for your wartime crimes! What would be the penalty for throwing away a bus ticket? Why was it wrong to feed the birds? Are any of the audience fifth columnists? Ending with the trial of that most infamous of medieval criminals, the spiv! 26 – 27 Audley End – Our first ever visit to Audley End! Time Travellers go secrets & spies – Come meet Fred the Air Raid Warden as he explains all matters ARP, learn how to tackle firebomb fritz, what a gas mask was really like and try out the real morrison shelter for size! Ivy will be on hand to explain the rationing system. 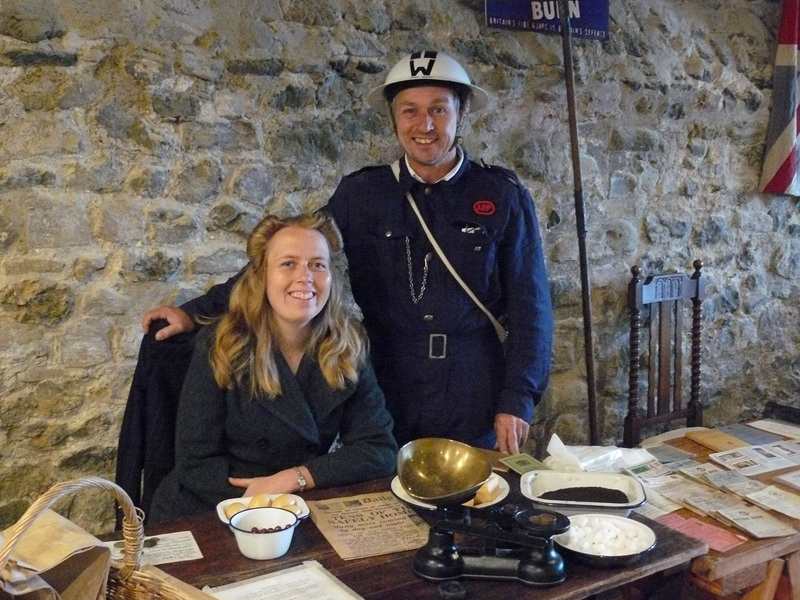 Young visitors can measure out a weeks rations and mark them off in the ration book. 24 – 28 Bodiam Castle – Medieval week for schools. Would you like to visit Bodiam Castle, why not make your students visit even more special by visiting Happening History at the castle. All week we will be running displays on medieval life. Students can learn about clothing, food, marriage, try on armour, hold a weapon or learn about medieval surgery. Booking is essential so please contact the castle directly or we’d be happy to pass on your details. 29 – 30 Bodiam Castle – Have a go at playing some medieval toys and games. What games would they have played in medieval times? What game did they play with sheeps knucklebones? What were their dolls like? What games had their beginnings in the medieval period? A day for all the family large and small. 8 – 12 Bodiam Castle – Medieval week for schools. Would you like to visit Bodiam Castle, why not make your students visit even more special by visiting Happening History at the castle. All week we will be running displays on medieval life. Students can learn about clothing, food, marriage, try on armour, hold a weapon or learn about medieval surgery. Booking is essential so please contact the castle directly or we’d be happy to pass on your details.